Ceylon Tobacco Company (CTC) launched a sustainable agriculture program for tobacco leaf farmers across the country in 2013, to introduce better crop management techniques, improve their contribution to the national food production and promote vegetable cultivation. An extension of the Sustainable Agriculture Development Program (SADP), CTC's flagship CSR initiative, SADP Ultra further enables them to generate an additional income by selling the surplus produce. "CTC is committed to conducting business in a socially responsible manner. In this regard, the company places special focus on leaf production and empowering and improving the livelihoods of one of its key stakeholders, the leaf farmer," a company spokesman said. 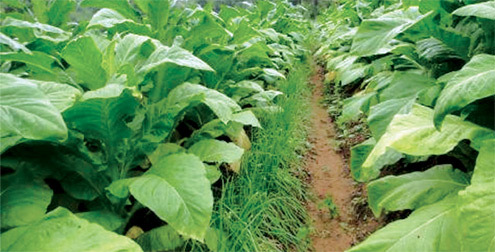 With 4,100 farmers spread across nine districts, the tobacco farming sector infused Rs. 1.4 billion to the rural economy in 2013. Based on the feedback received from the stakeholder engagement programs, CTC's Leaf Department developed a sustainable cropping model for farmers, with the support of the Department of Agriculture and the Natural Resource Management Centre (NRMC). These combined efforts resulted in the launch of SADP Ultra, to improve the overall quality of life of the leaf farmer. Under this initiative, farmers are provided with the supplies and know-how to grow other field crops (OFC) such as maize, green gram, long bean, white cowpea and red onion in addition to their cultivation. These crops fulfill agricultural needs such as wind barriers, integrated pest management, serving as either alley or border crops and maintaining an overall improved level of biodiversity. The program not only improves the lives of the farmer, but also converts them into model farmers, participating in peer-to-peer sharing of agricultural best practices. SADP Ultra supported the livelihood of 4,100 tobacco farmers and over 16,000 beneficiaries in its inaugural year.